You can substitute a homestay during your Phang Nga Bay kayaking adventure instead of the normal bungalow option. There is no extra charge for switching to a homestay. You can stay as many or as few nights at the homestay as you wish. See our homestay image gallery. Dinner and breakfast are included with the homestay option. The local families loved treated their guests to stunning Thai meals. The ability of a stunning destination to remain traditional and authentic is difficult to say the least. Koh Yao Noi however, is one place that has changed very little over the past decades. 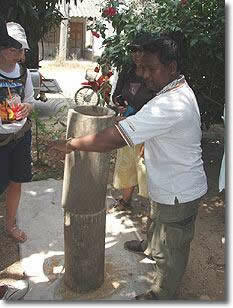 Traditionally, Koh Yao Noi has been a Muslim fishing village. That is not to say that there aren't any Buddhists on the island. There are, but they are not the majority. There is absolutely no problems between them. Nestled between two mass tourism destinations, Phuket and Krabi, it is refreshing to see that the villagers haven't sold out to mere money. They still find great pleasure in sitting under a tree or throwing a line in the water. They have retained their laid-back attitude. Downtown Koh Yao Noi consists of a few restaurants, small convenience shops, fruit and vegetable displays, hardware shops, and a couple of internet cafes. There is one 7 Eleven however. Rice is such an important part of Thai culture that the language used to describe eating literally uses the word rice in each instance. Are you hungry would be said, "Hungry rice no?" Or, are you hungry for rice. If you're full you would say something like, "Eat rice already." There is a Thai word for food, but they seldom use it. So, as rice is so important, the locals can show you how rice was processed in the past... and some still use this method. 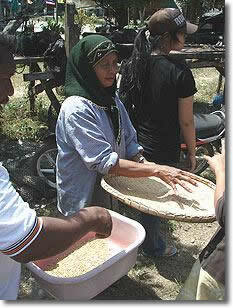 You'll see some methods used to separate the rice from the hull. 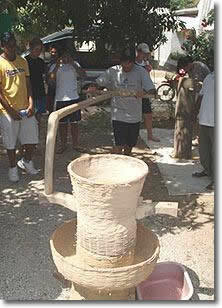 It's fun to do and you'll get a chance to work the 'machines' if you wish. Another trade on the island is rubber. Unfortunately this monoculture isn't exactly the best thing for the environment. However, this is a cash crop for many of the islanders. 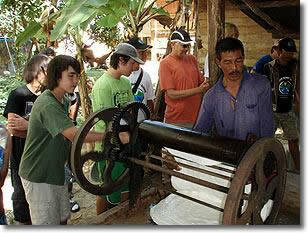 They like showing travelers how to produce a rubber mat. It's actually rather interesting. You'll get to tap a tree with a special knife and work the rolling machine that makes the mats. With the homestay, of course, you get to stay in the homes of the locals. Their homes are not simple wooden shacks in the jungle. They are very nice homes with tile floors and all of the usual amenities. But, they are not frivilous or overly fancy. You'll get to eat the same food that they eat. This doesn't mean that you're going to be forced to eat a handful of chili peppers! You can learn how to cook Thai dishes if you're interested. You also get to participate in their lifestyle. 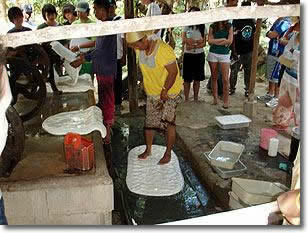 If they're rubber tappers, you can join them. If they're fishermen, you can join them. 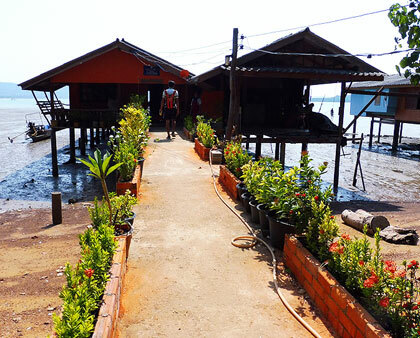 Basically you get to experience what it's like to live on Koh Yao Noi. The best thing in my opinion, is that this is the way it's been and hopefully will remain for many years to come. Note: Sea Kayaking Thailand / Paddle Asia, only offers Homestay Programs as part of their tours or programs. We do not book homestays for people who just want a homestay. You can contact them directly if that is what you desire. Copyright � 1999-present Paddle Asia Co., Ltd.�All rights reserved.